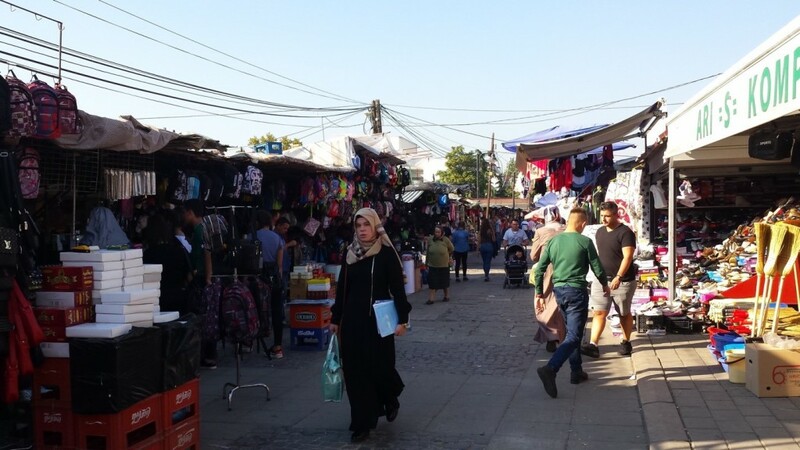 If it hadn’t been for business my sister had in Macedonia, I might never have visited this small Balkan country that was once part of the former Yugoslavia. When she suggested I join her and spend a few days there before embarking on other travels we had planned, I found myself having to get my bearings (where in Europe exactly?) and wondered what there was to see there (the country hadn’t been advertised as a vaunted tourist destination in any of the tourism feeds I subscribe to). 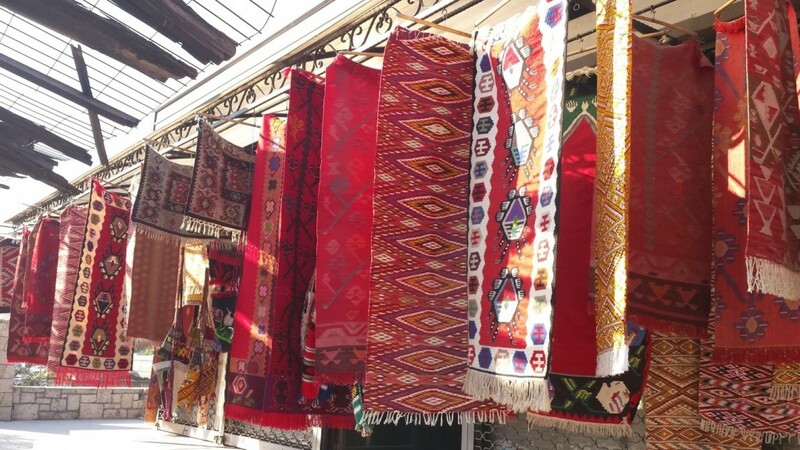 An itinerary suggested by Time for Macedonia sounded promising: two days on the road with a guide followed by a day and a half on our own in Macedonia’s capital, Skopje. We’d be there at the end of September avoiding crowds of tourists while still enjoying good weather. And we’d be visiting a UNESCO Word Heritage Site, reason enough for me to visit any country. While the country is commonly referred to simply as Macedonia, it’s official name is the Former Yugoslav Republic of Macedonia (FYROM) or the Republic of Macedonia for short – not to be confused with the geographic region of Macedonia in northern Greece (directly to the south of the Republic of Macedonia). Both countries are situated on the Balkan peninsula (a region in southeast Europe named after the Balkan Mountains), but unlike the Republic of Macedonia, Greece isn’t one of the political communities included in the Balkans. I don’t pretend to know what that means in political or practical terms for either country, but they’re both members of the UN whose mandate is to foster international cooperation. And I’m all for that. You can see from this map that Macedonia is landlocked. But what it lacks in seashore, it more than makes up for in lakes. 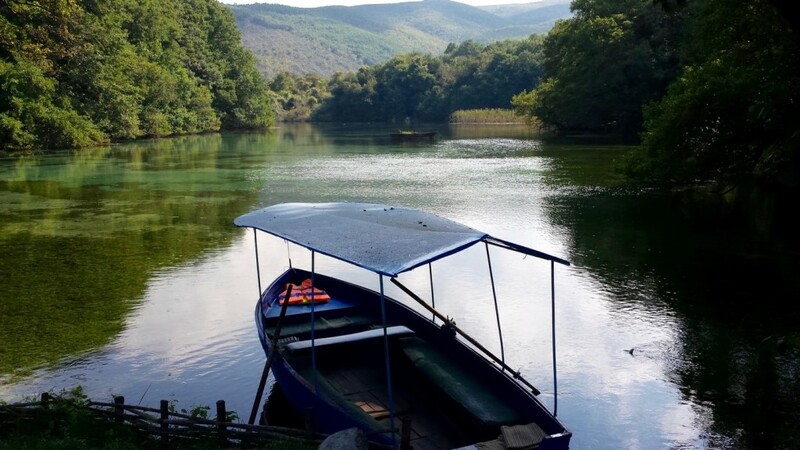 Its three largest ones (Ohrid, Prespa and Dojran) are natural lakes of tectonic origin (depressions formed by movement of the earth’s crust), but Macedonia has a host of glacial and artificial lakes as well, not to mention a major river (the Vardar) that runs through it. Plenty of water here – an enviable natural resource touted as one of the cleanest in the world. Safe to drink. Also the best tasting water I’ve ever had. 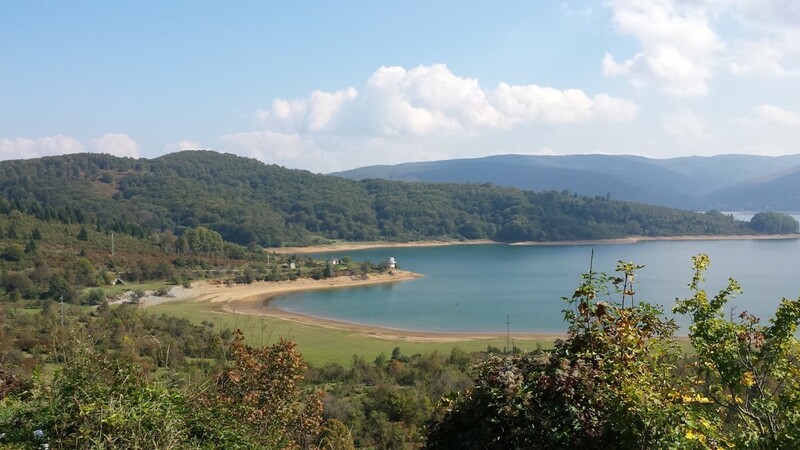 Mavrovo Lake (one of Macedonia’s artificial lakes) in the National Park of Mavrovo. According to one source, Macedonia also boasts the greatest number of mountains in the world (not the highest, but rather the most). I haven’t fact checked that, but given that the majority of the country’s topography is mountainous, I don’t have a hard time believing it. Even Macedonia’s coat of arms will tell you this is a country of lakes and mountains. You’ll find its highest peaks in the National Park of Mavrovo (one of three national parks here and our first introduction to the country). This is a nature-lover’s and outdoor enthusiast’s haven, and if ever I were to return, I’d put hiking on the agenda and get myself to all three national parks along with Matka canyon. 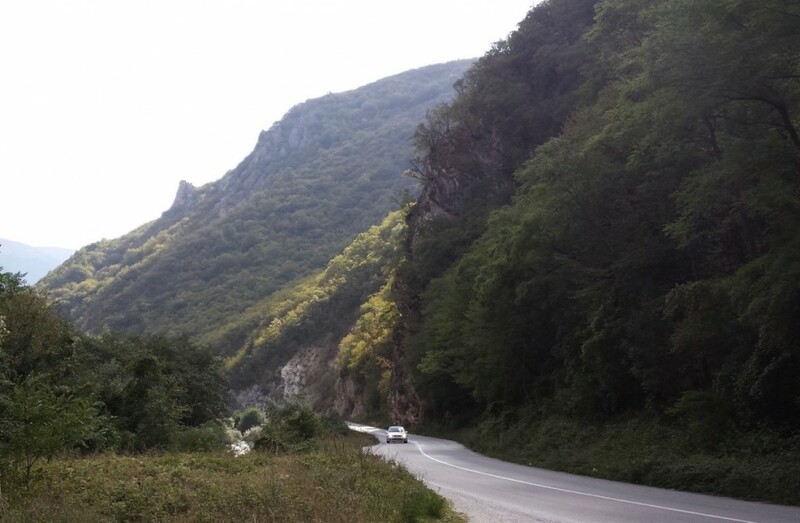 With Macedonian millennial, Bojan Pavlov, at the wheel, we took a scenic drive through Mavrovo National Park, stopping in at the Monastery of Saint Jovan Bigorski on the slopes of the Bistra Mountain. 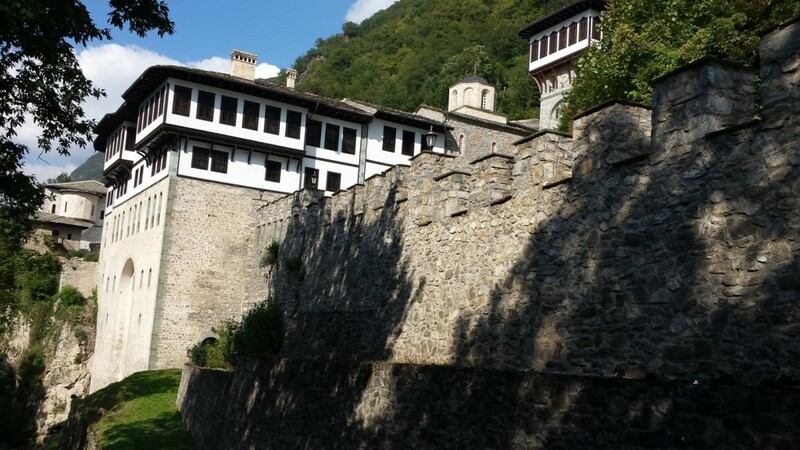 Dating way back to the 11th century (later destroyed by the Ottomans then restored in the 18th and 19th centuries), this monastery is a pretty big deal as cultural-historic sites go in Macedonia. 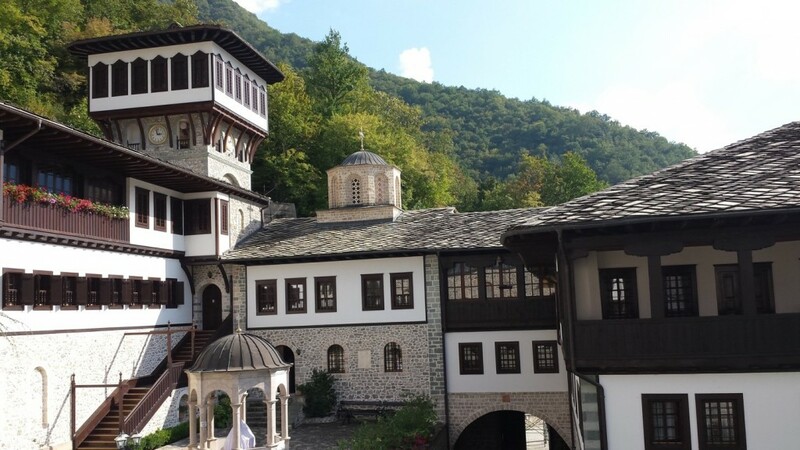 It belongs to the Macedonian Orthodox church (a form of Christianity) and is dedicated to St. John the Baptist, a revered figure in many religions, not just Christianity, who was considered a prophet and noted for baptizing his many disciples, including Jesus. 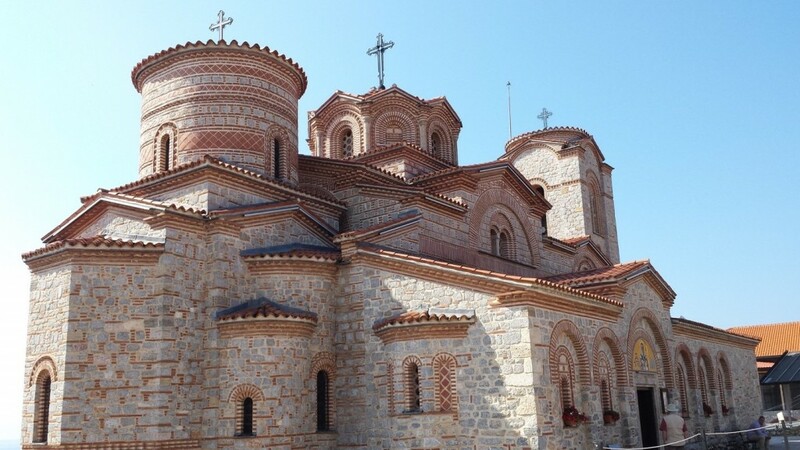 While orthodox Christianity is the dominant religion in Macedonia, about a third of the population is of Islamic faith, and you’ll see mosques dotting the landscape along with churches and monasteries. If you’ve travelled to Meteora in Greece, you’ll be reminded of the monasteries there. If you have yet to travel to Greece, be sure to visit Meteora. 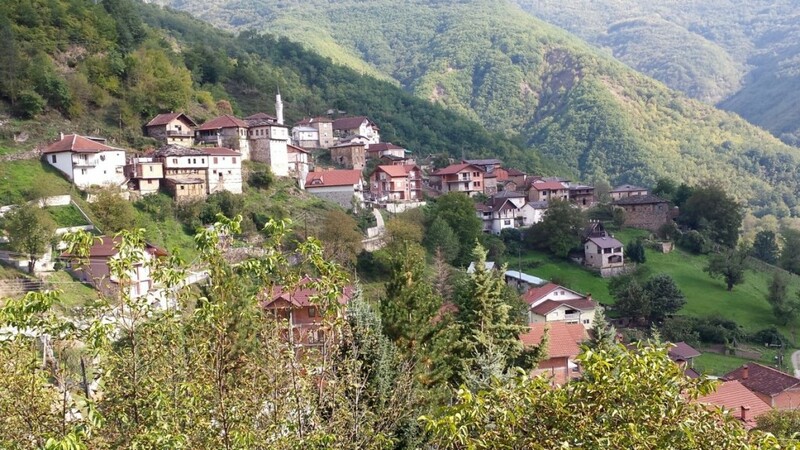 Monasteries and mosques co-exist in Macedonia (see the mosque in the distance above?). Entrance to the monastery’s church with candle stands outside where you can place a lit candle and say a prayer for someone living (top tier) or dead (bottom tier). 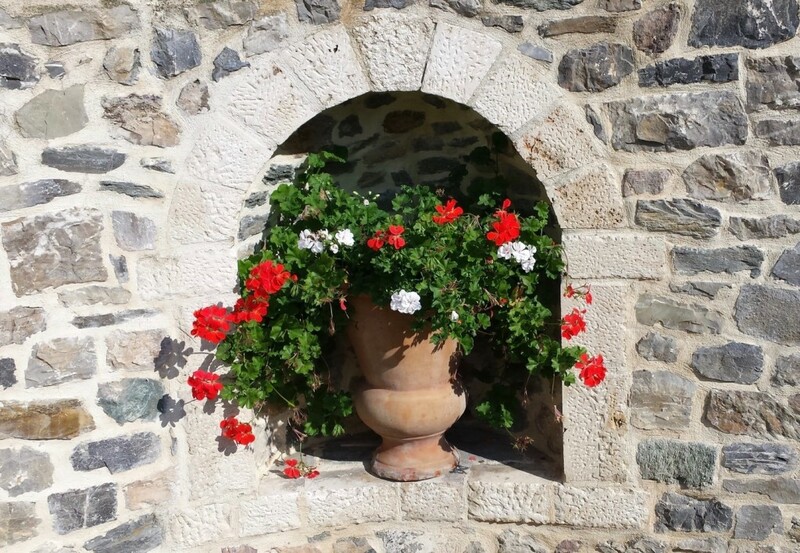 The bedrock in this area and the beautiful stone used to build the monastery is limestone. 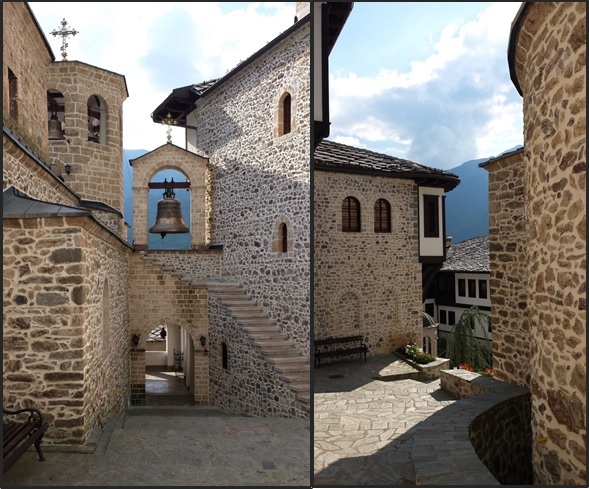 From the Monastery of Saint Jovan Bigorski, we made our way to the nearby village of Janče (one of many picturesque villages in the mountains), where we stopped for a very late lunch at the Hotel Tutto. 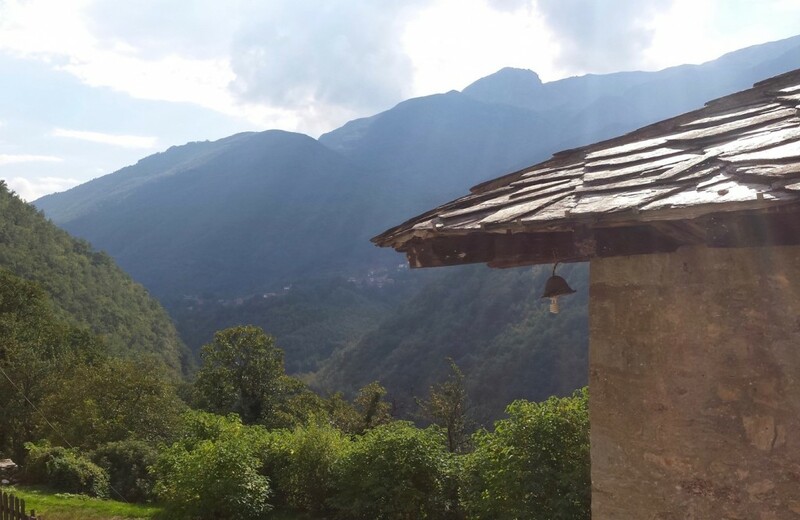 The hotel offers a beautiful view of the village and the surrounding valley and mountains along with delicious local fare (so worth the wait). 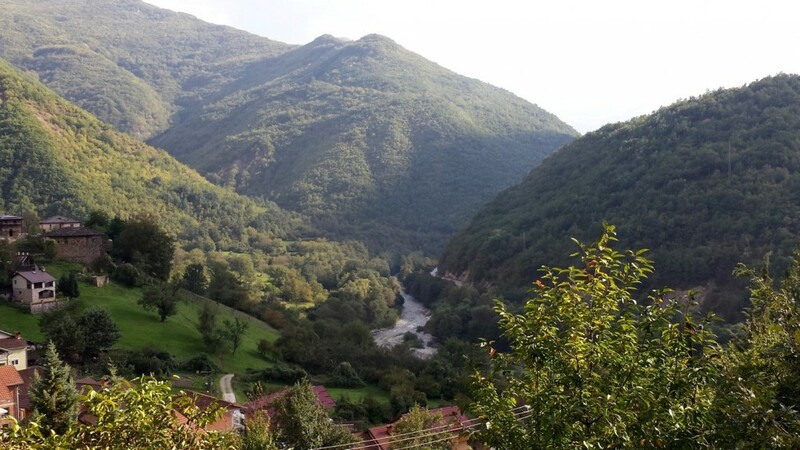 View of Janče from Hotel Tutto in the Radika valley in the National Park of Mavrovo. The Radika river runs through the Radika valley. 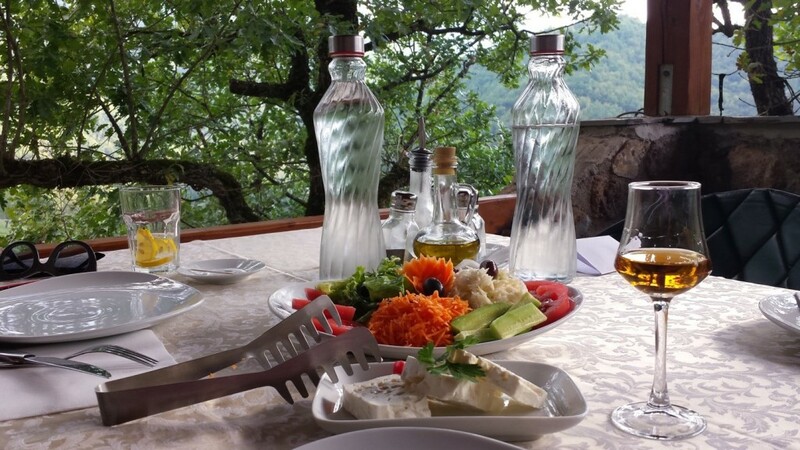 I gather Macedonians enjoy a relaxed way of life and love sitting for hours over a meal shooting the breeze and spending time with each other. Nice. In a beautiful, relaxed setting like this, it was impossible not to follow suit, so we lingered over a mezze of local mushrooms and veggies, a potato-filled pastry, and a few national staples that included a white sheep cheese (sirenje) similar to feta, a roasted red pepper relish or spread called ajvar (I adore the stuff), and a glass of homemade rakija, a smooth and delicious amber-coloured fruit brandy with an alcohol content of about 40% (home brews can be double that or more). The downside of lingering over that meal (no regrets) was reaching Vevčani Springs in the dark – too late to see the springs (a reason to return to Macedonia some day) so we didn’t stay long before driving on to Ohrid, where we’d spend the night and tour the city the next day. A place has to have special cultural or physical significance in order to be recognized by the UN as a UNESCO World Heritage Site and be afforded protection under international treaties. 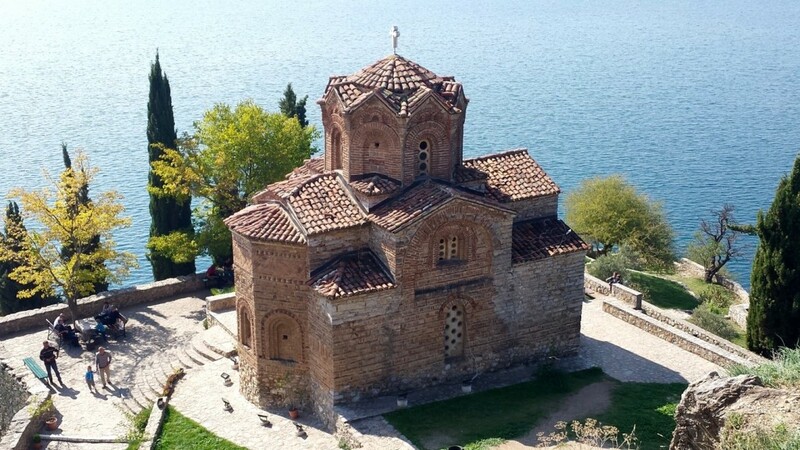 It happens that Ohrid is one of less than 30 places in the world that’s designated as both a Cultural and Natural world heritage site. It’s a “must-see” if you’re ever in this country. 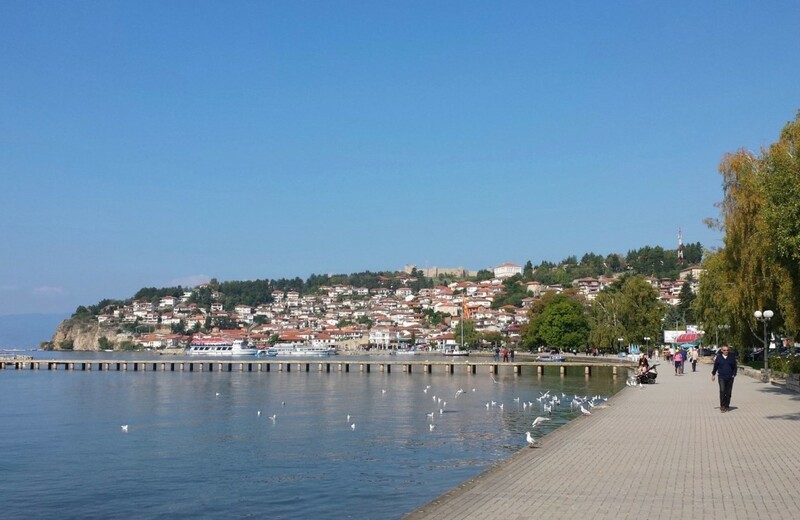 It’s not the largest city in Macedonia, but it is the largest city on the largest natural lake (Ohrid) here. And it’s charming. 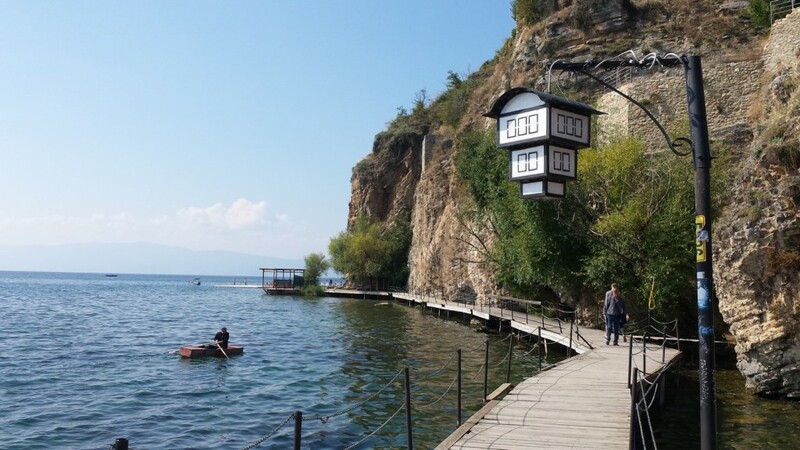 A law prohibits people from building additions that would obscure another person’s view of lake Ohrid. 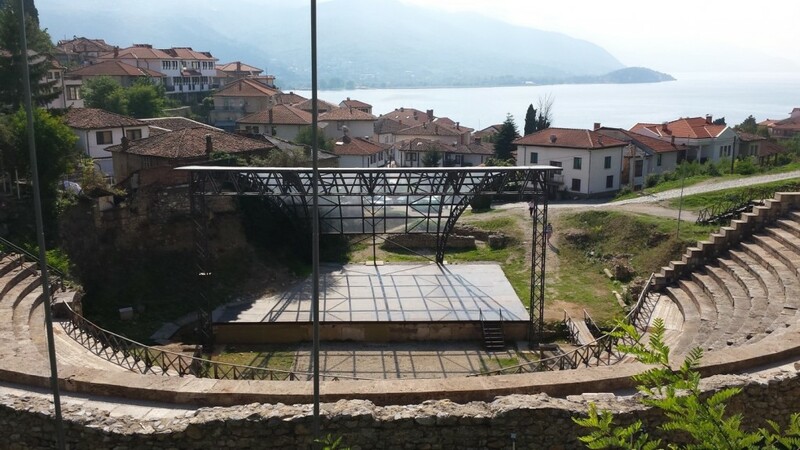 Ohrid’s ancient amphitheater dates back to 200 BC. Once the site of gladiator fights and executions of Christians by the Romans, it was buried by the locals (none too keen to be reminded of their plight) after the Roman empire fell. The amphitheater was unearthed in the 80’s and hosts all manner of public performances (concerts, plays, etc. ), drawing global talent. The theatre can seat about 2500 people. I’m betting the acoustics are as fabulous as the view this venue has of lake Ohrid and the mountains. 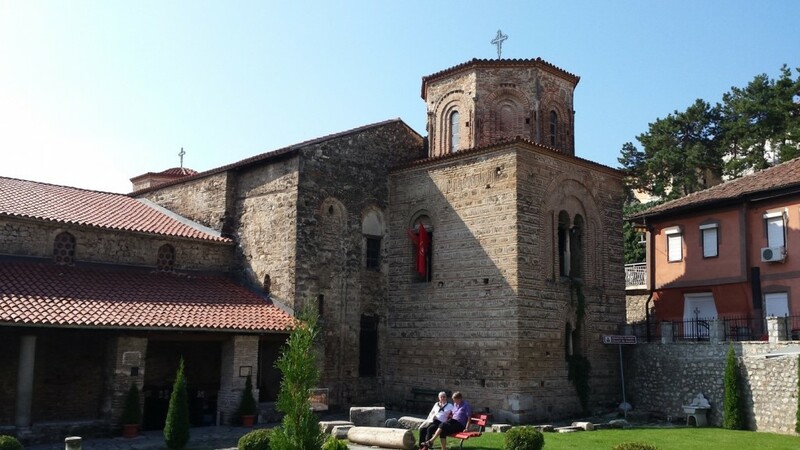 If you hear Ohrid referred to as the Jerusalem of the Balkans, it’s because it once accommodated a remarkable number of churches (one for every day of the year). It still has many (some quite small) and among them, the medieval church of St. Sophia (once converted to a mosque by the Ottomans, then re-converted to an orthodox church). I gather any city with a church named St. Sophia is considered a holy city (that is, especially sacred to those following this religion). 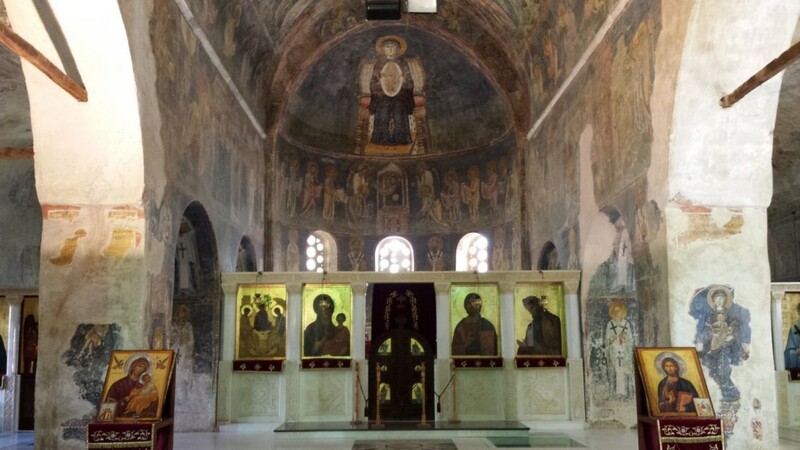 Inside the church of St. Sophia you’ll find a rare depiction of Mother Mary carrying Jesus in her womb (seen here in the centre of the fresco on the ceiling). Saint Panteleimon-Clement monastery on the Plaošnik archeological site in Ohrid. 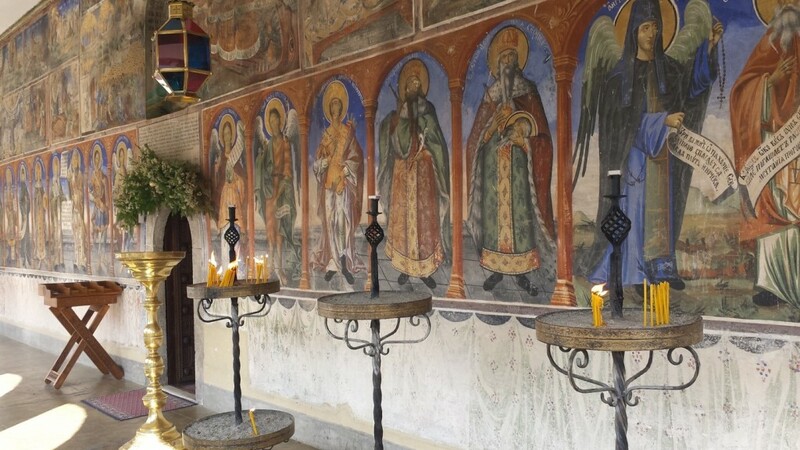 The monastery was built by Saint Clement who dedicated it to Saint Panteleimon. It too, was once converted to a mosque by the Ottomans, then later converted back to a monastery. This is where disciples of Saint Clement came to learn Cyrillic script (among other things), so it seems fitting that a new university is being built next to it. 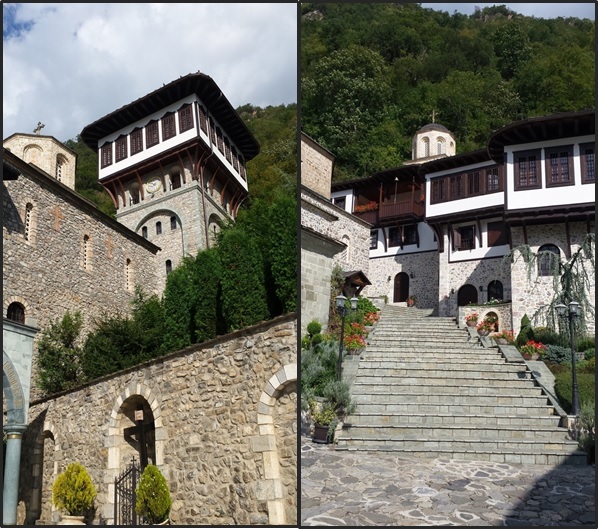 The monastery is beautiful with its warm earth tones and lovely architectural lines – and its setting overlooking lake Ohrid equally so. 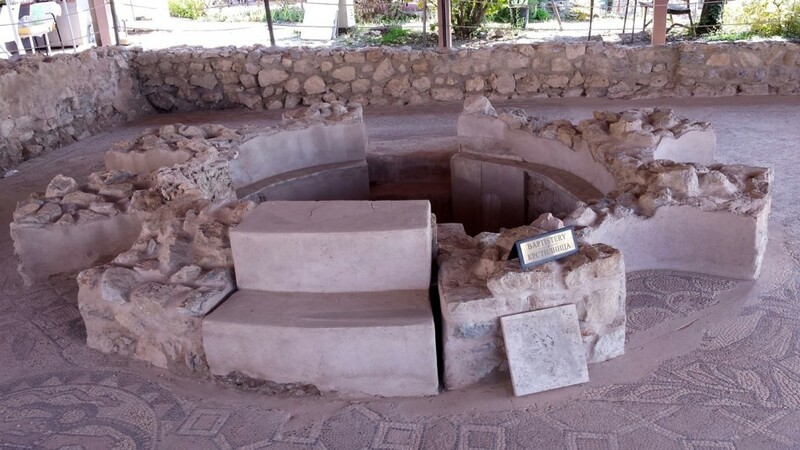 An especially large ancient baptism chamber with surrounding mosaic tiles on display at the Plaošnik archeological site. St. John the Baptist would approve no doubt. 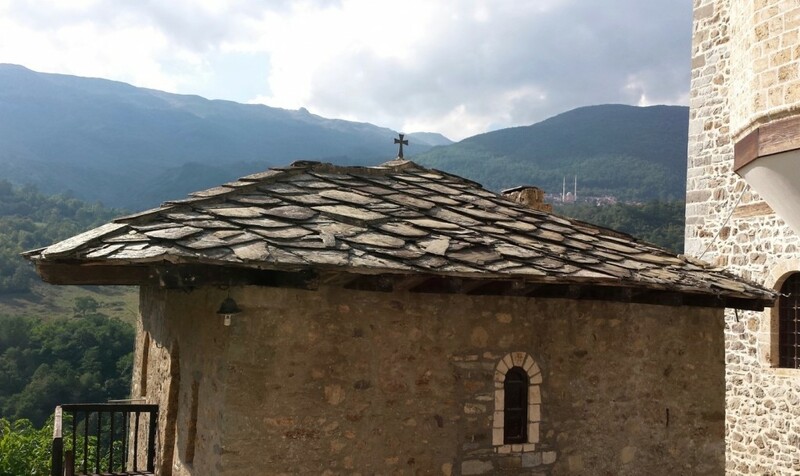 From Saint Panteleimon-Clement monastery, you can follow a path through an alpine forest (smells heavenly) then head down a cliff to the small church pictured below and onward to the “bridge of wishes.” It’s the route Zivka (right) and I (left) took on our way back into town. 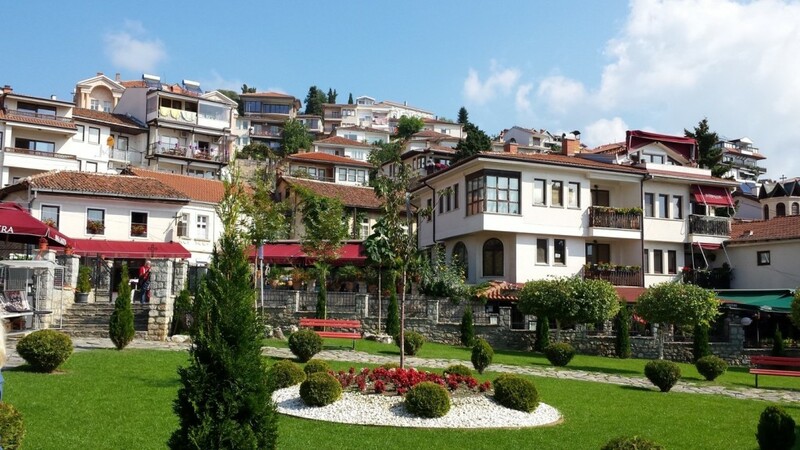 The views of the old town and lake Ohrid are spectacular from here. (My photos don’t do them justice.) The lake is the largest and deepest natural lake in Macedonia (about 300 m deep). And so clean that you can see 22 metres deep in some places. Pristine. Unfettered by noisy water traffic. Peaceful. 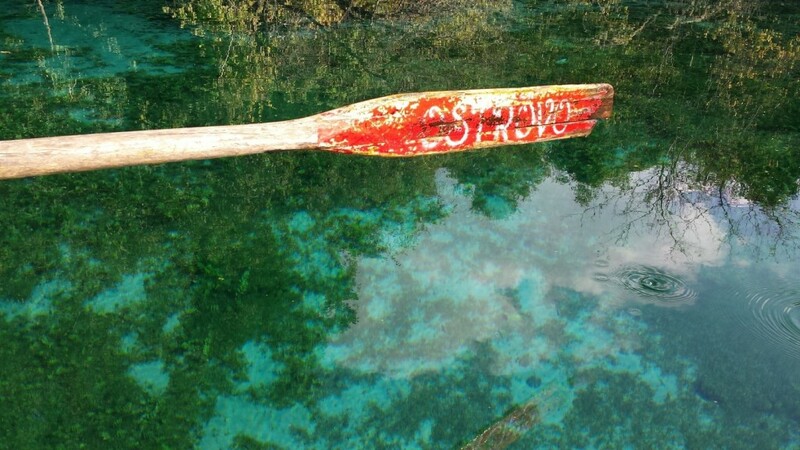 Also home of the Ohrid trout, an endangered species that can survive only in these waters. 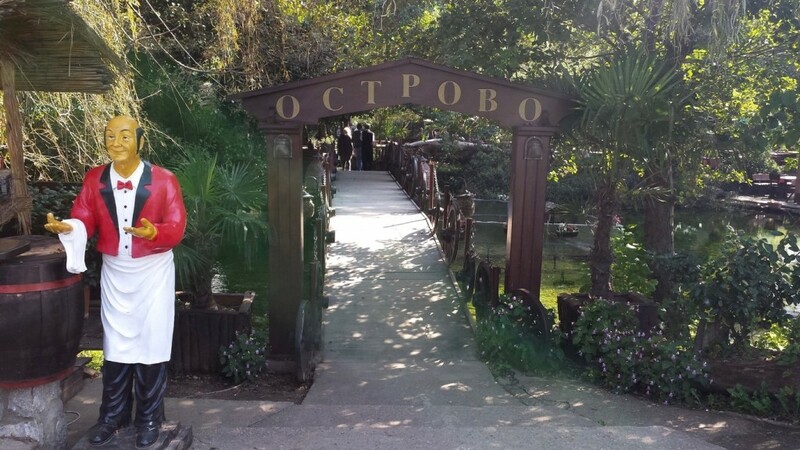 Ohrid’s “bridge of wishes.” Not a bridge so much as a nice boardwalk towards the end of which is a series of brass plaques on a railing depicting signs of the zodiac. The idea is to touch the plaque corresponding to your sign, make a wish and toss a coin into lake Ohrid to make your wish come true. I loved Ohrid. And I’d have been happy to spend the rest of the day there, but we still had St. Naum on our itinerary and had to make our way to Skopje before the end of the day. 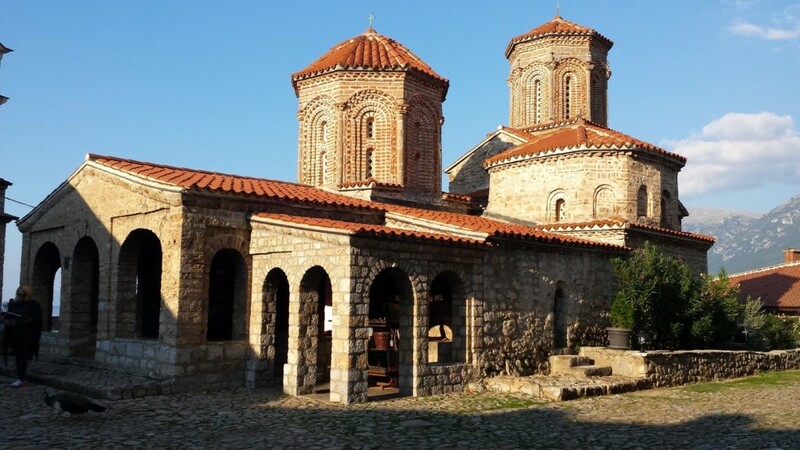 I rejoined my sister and Bojan for the short jaunt from Ohrid to the south on a winding road that takes you past Galicica National Park to St. Naum monastery on Lake Ohrid (a stone’s throw from Albania’s border). Before visiting the monastery, we stopped for lunch and a ride in a rowboat on the springs of the river Crn (Black) Drim. Our lunch spot and the surrounding waterway and scenery was gorgeous and serene – another highlight of our short time in Macedonia. My sister, Ania, enjoying lunch, a bit of rowing, and shopping for Ohrid pearls made from the shiny underbelly scales of the Plasica fish. The pearls are pretty, not very expensive, and make a nice souvenir. If you go for a ride in a row boat here, you’ll see spring water bubbling up through the sand over parts of the river Drim. Magical. The monastery of St. Naum affords another great view of lake Ohrid, and if you’re really, really quiet, you can hear St. Naum’s heart beating if you press your ear against his tomb inside the monastery. So they say. On the grounds of the monastery, you’ll find both coloured and albino peacocks wandering around. 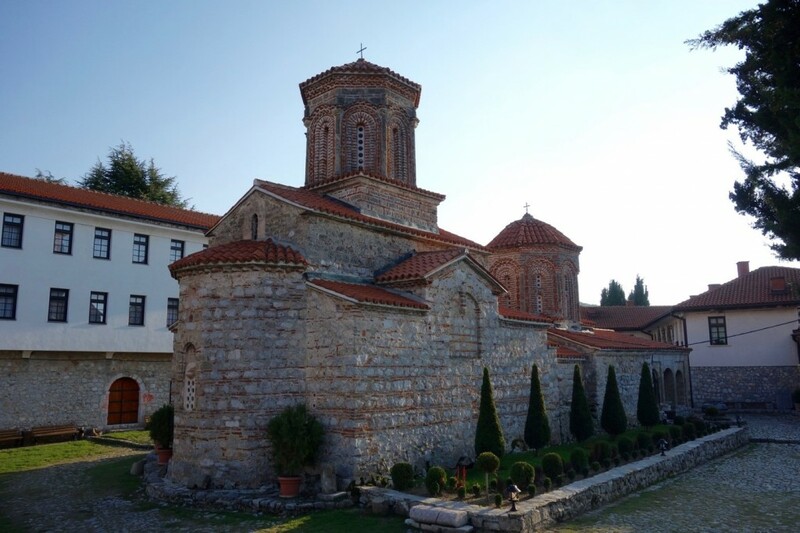 Speaking of St. Naum, it turns out that Macedonians in my home province in Canada have an Orthodox church of their own named St. Naum of Ohrid. Small world. 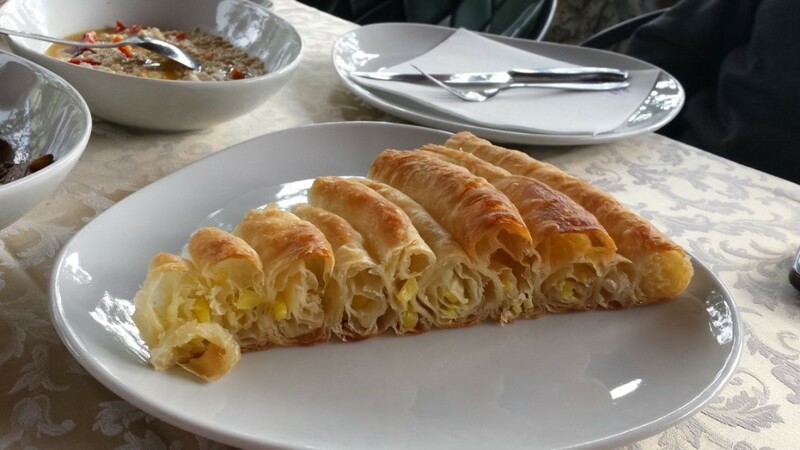 Bojan dropped us off in Skopje, Macedonia’s capital, with suggestions about how to spend our free time there. It was too nice a day to spend in a museum, so we wandered around the city centre instead. 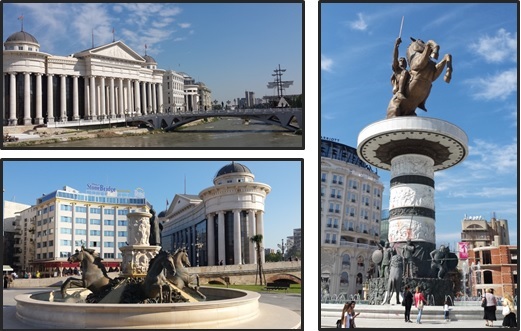 In ’63, Skopje had been levelled by an earthquake, and various nations helped rebuild it. But the architects behind the new design planned for only about 200,000 inhabitants, and the population has far exceeded that. (If that’s put a strain on infrastructure and such, we weren’t there long enough to experience it.) 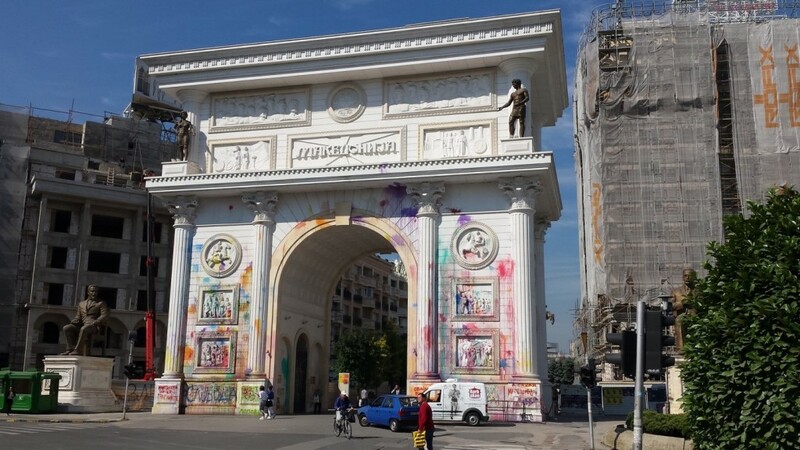 Skopje is still going through a makeover that started in 2010 – a refitting of government buildings, an abundance (some might say excess) of new statues and monuments, an Arc de Triomphe-style gate to the city, and a couple of bridges — all of which cost a small fortune and generated some controversy. The prettiest graffiti I’ve ever seen on a national monument, but graffiti nonetheless and speaks to public unrest in this country. A group of people were demonstrating (peacefully) outside this gateway the day we were were here. It’s 2016, and there’s a lot of that going around. 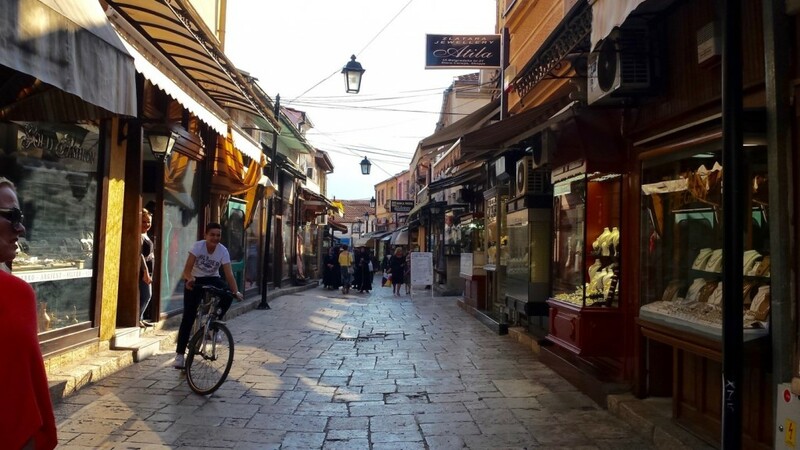 From the city centre, we made our way over a stone bridge to the Old Bazaar, one of the oldest and largest marketplaces in the Balkans. 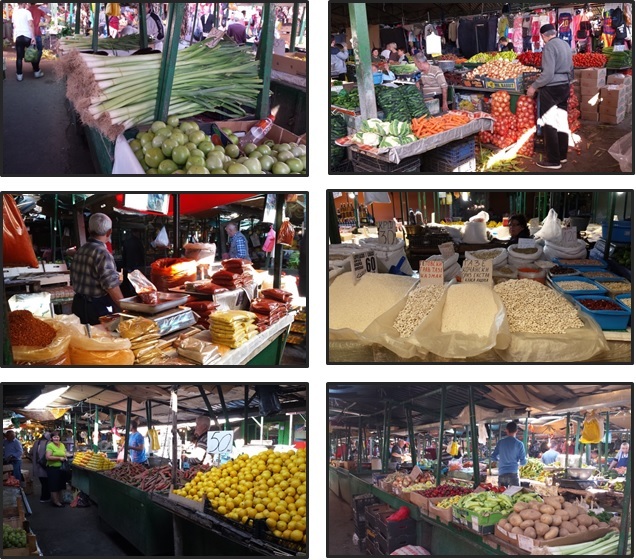 Wandering through that labyrinth, we eventually found a fabulous farmer’s market with an extensive and colourful array of produce (some of which was easily double the size I see back home) and dried goods. Three and a half days. 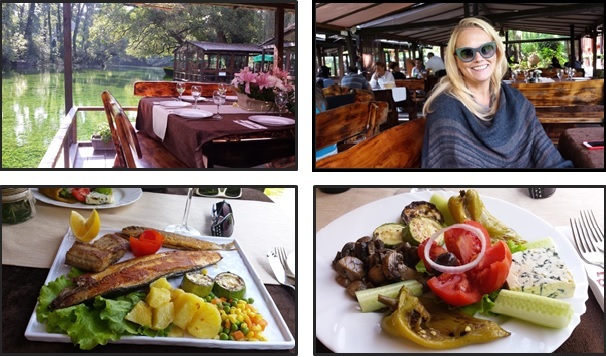 A bit of a whirlwind tour of a country that hadn’t been on my radar as a tourist destination. An itinerary that took us to sites worth seeing (and to none that weren’t). A flexible, relaxed pace despite a tight timeline and a fair distance to cover. The great company of an educated, thoughtful, well-rounded, easy going guide with a good sense of humour and a ready smile. If you have the pleasure of touring with Time for Macedonia’s, Bojan Pavlov, you’ll learn that he’s an avid outdoorsman who loves coffee and country (possibly in that order). He can tell you all the best places to hike or climb in his country, not to mention where to get the best coffee. Would I go back? Absolutely, given the chance.